Now suggest to work on making the game a bit more engaging as everything is waaaayyyy too slow as of now! Yes, you're right. The game starts a bit too slow. It gets faster in harder levels but it takes a while... I'll see what I can do to make the pace a bit faster! Thanks for the feedback! Actually, I like how slow it is ! There's a general laid back feel to the game that is pretty enjoyable. And it's nice for a while to have enemies who don't just fly off the screen but make a U-turn to let you finish them off ! Thanks! Yeah, the idea is that the starting levels are slow and easy. Later on around level 4 or so there are a lot more enemies and it starts to get a bit faster. I'm getting a lot of feedback on this game via several channels, and the most common theme is around the fact that it feels way too slow. My plan was that you'd be dodging enemies barely surviving, but in most cases people are just yawning waiting for enemies to show up. I may fix this by doing away with the wave system and just spawn enemies continually. Does anyone have any thoughts on that? It seems nothing but adds a lot to the immersion. Yeah, muzzle flash and flash at enemy impact are definitely a good addition. Should enemies be pushed back when they are hit? Or maybe get pushed in a random direction (to prevent a strategy where you're constantly ahead of the enemy shooting at it repeatedly and never miss). How do I prevent the enemies from shooting? I'm up at the last level right now and I can't beat it. Cool!! What were your final stats? What upgrades did you have to buy? If I did things right, gameplay now feels significantly faster and more engaging. Please take a look and let me know. If you want to wipe your save and play the new version from the beginning, go to the STATS screen, then HOLD up+left+Z and tap X while holding those three keys. Also, what does "btco" stand for? I pronounce it as "Bit Co.". Did anyone reach the end of the game after the v1.1 update? Worried I might have made it too difficult. I don't think i did that well but yeah. really incredible game. i thought enemy speed was great and the power up system was super cool. https://cdn.discordapp.com/attachments/449063336663842818/454815138395062294/Screenshot_from_2018-06-08_18-11-38.png for stats. Nice! Thanks for playing. Looks like it took you just short of 1 hour to finish the game, which is what I was aiming at. Hope you enjoyed it! Maybe you can do a Let's Play video for Pilot 8 like you did for Thunder Bella? How can I reset the game data to start from scratch ? Go to the Stats screen from the main menu. While in the Stats screen, hold UP + LEFT + Z at the same time, then press X, then release all keys. It has to be done in that exact way (to prevent accidental wipes). The cart will reboot, and your data will have been wiped. Ok, finished in 39 minutes. It's doable. Note : the gameplay time keeps ticking even after winning while in the stats screen. I propose pausing it while in the stats screen. Great, thanks! 39 minutes is really good! I don't think I can beat that. And yeah, the fact that the time keeps ticking in the stats screen (and all the other screens) is a bug. It should only tick while in actual gameplay. I'll fix it on the next release. Hmmm apparently there's a rare bug where the game won't finish the level even after you kill all the enemies (maybe an enemy gets stuck off-screen?). Not sure what causes it to happen. Anyone experience that? I've never experienced it. Nice to see that you brought your TIC-80 PFP over here to this forum. I still see the bug once in a while but I haven't figured out what is the underlying reason. I'll update the game once I figure it out and fix it. Let me know if you notice any other glitches. 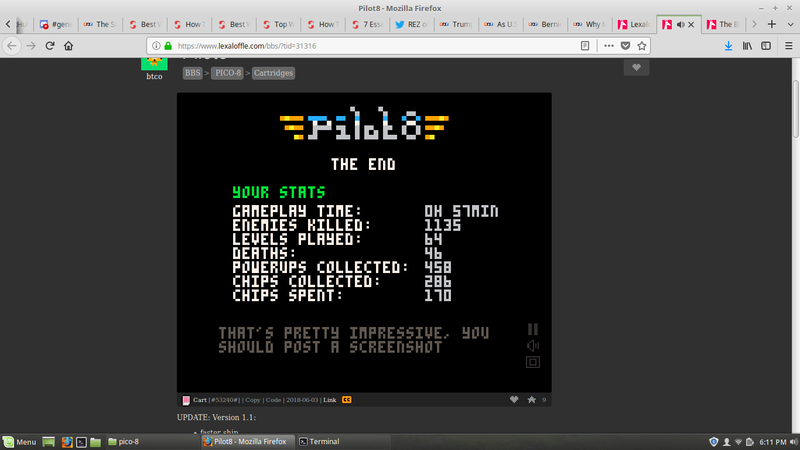 @instant_trigger I beat it once when 1.0 was the latest version of the game, yeah.